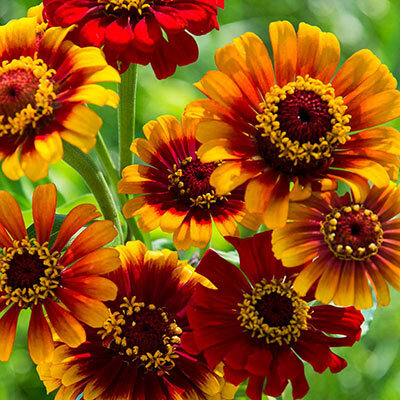 Plant Sombrero Zinnia and you'll be delighted at the butterflies and pollinators that will visit your garden. You'll also enjoy a long season of bright, bold color from summer all the way through fall. Single and double blossoms are easy to grow, require no deadheading and grow quickly. They bloom in shades of gold, orange, red and bicolors. This mix does best if planted in full sun and well-drained soil. It's a perfect choice for borders, containers and cut flowers. Foliage: Green, typical Zinnia foliage. Flower Form: Bright and bold, single and double blooms in shades of gold, orange, red, and bi-color.